“Boiling Under”, an independent study performance created by Alexia Barandarian ’19, sought to disrupt the illusion of “effortless perfection.” Katie Brule/Photo Editor. This past Saturday I found myself in a familiar place: the Schow Science Library. Only this time, after reaching critical mass, the frenzied motion I was studying wasn’t in a glass beaker. 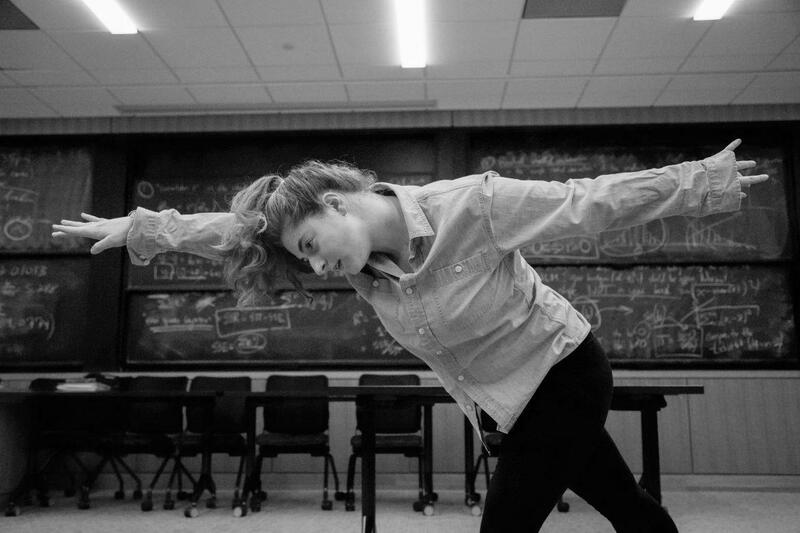 Around fifty of us scurried behind Alexia Barandarian ’19 and her cast in her independent study performance on imposter syndrome, Boiling Under. Barandarian was inspired by research on psychological “syndromes.” Working within this scope, she reviewed interpretative dance performances tackling the difficult topics of alcoholism, post-traumatic stress disorder and impostor syndrome. As we filed through Schow’s entrance, we were each handed a rubber band from an assortment of colors and waited on the edge of our seats wondering when it would all begin. Would there be steam? Lots of deliberate bumping and method acting in the moves themselves, as a sly reference to how molecules in a boiling solution collide with each other? Looking for clues didn’t seem to help much: the boards were covered, seemingly at random, with slabs devoted to French conjugations, calculus and biochemistry reactions, among other things. But upon closer inspection, isolation in the cast seemed to be emphasized – two dancers dressed in chambray shirts and leggings, stood side-by-side as they worked on completely different things without consulting each other. Then, suddenly, it happened. Flitting before our eyes, before settling into a precariously balanced ballerina pose, a blonde dancer beckoned to us to follow her outside of the Math and Science Resource Center (MSRC). The performance had actually been going on all along – with the dancers ignoring us because they were so engrossed in the busywork building blocks that structure the typical student’s day. The fact that their backs were turned to us, and that they didn’t even acknowledge each other, cast Boiling Under into a spotlight at once delightfully postmodern and disturbingly telling of campus culture at the College. When I say “culture,” I don’t mean blaming administration, which is a commonplace and frankly unoriginal response at the majority of colleges and universities in the United States. Tossed into the sea of bodies, we trailed behind the rest of the cast through a maze: first to the breakout space near the glass room, then to the center carrels, to the rightmost stacks, back to the carrels and finally to the MSRC again. But if there’s one piece of advice Barandarian’s piece tries to leave the audience with, it’s shaking impostor syndrome and cultivating something that can rescript this negative student culture from the inside out. Barandarian’s research invokes findings from the 1980s of both Pauline Clance and Suzanne Imes. Academics found the “impostor syndrome/phenomenon” to be a “pattern where an individual continuously doubts their achievements and has a persistent internalized fear of being exposed as a ‘fraud’, regardless of external evidence of competency,” Barandarian said. While it’s far from easy to try to assure a first-year (or senior) that they weren’t an admissions mistake, I’m wondering if the issue is less one that needs to be treated with validation and affirmation, and more with leaving behind worrying about the past or yourself for too long altogether. The toll impostor syndrome can take was made evident by the duets that started with dancers alone in the frame (sometimes drowsy from lack of sleep or addiction – a reference to alcohol issues prevalent in college) that would end up being joined by another trying to pull them into more active, stable postures. Each piece featured motifs of rising and falling, pushing and pulling – basically any act of opposition that would pull one of the dancers from the syndrome-induced daze. Barandarian explains her choice for these motifs, the piece’s title and the rubber bands as all having to do with high stress situations. “The unseen agitation that erupts before diving down again” refers to how Boiling Under in a person can take place beneath the surface and go largely undetected, she said. But the rubber band stays resilient – it can be stretched by external stresses before snapping back into place, or restoring its own sense of equilibrium. It can also double as a grounding technique to soothe anxiety and call someone back to present. But this already resolves more than half of the battle. Caring less about ourselves and more about others – for long enough to ditch sleeping at carrels or shutting everyone out in a pursuit of isolated self-improvement – seems to be what’s prescribed by all of the duets in Barandarian’s scene. This plays out beautifully in the final choreography when all of the dancers are working fluidly instead of in isolated fragments; learning new things from others to actively deal with the present instead of worrying about an already solidified past seems to be the major takeaway. This project is being taken further, and Barandarian’s piece is currently under consideration for a Claiming Williams Day workshop.